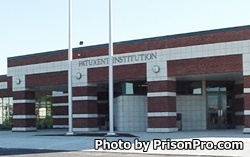 Patuxent Institution, also known as Correctional Mental Health Center Jessup, is a maximum security prison that has a maximum capacity of approximately 1115 inmates. With a little over a thousand male inmates, the majority of offenders at this facility are males, with only 110 female offenders. This facility specializes in serving inmates who have mental health issues, and many of the programs the facility offers are geared towards mental health well being. Many of the offenders are treated at this facility and then eventually transitioned into other state prisons. In addition to mental health programs, Patuxent Institution offers inmates substance abuse treatments. This prison is also responsible for evaluating newly committed inmates who have mental health issues. Offenders can also participate in educational programs that allow the inmate to earn a GED and gain certification as a master gardener in the horticulture program. Visiting is on Fridays from 6:30pm-9:30pm, and on Saturdays, Sundays and Holidays from 9am-5pm. Inmates who are in disciplinary segregation have visiting on Saturdays and Sundays from 10am-1pm.